When it comes to power supply, who needs bells and whistles? 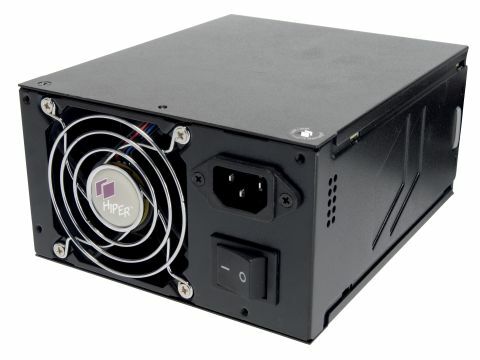 Unlike some of the other PSUs from Hiper, this lacks modular connectors and does not come packaged with unnecessary frivolities such as plastic tool cases. The package does, however, have all the required splitter leads for SATA support and four PCI Express connectors attached to the unit and another four Molex rails dishing out power. Aside from those features, this is a standard but powerful PSU without the shiny exteriors, LED fans and flashing lights of other models. It has the only two things you need: wattage and connectors. Hook up an SLI setup and it won't complain, it is un-phased by Kentsfield and multiple hard drives will not cause a problem. By only supplying what your PC really needs, costs are kept down and the 730W Type M offers high wattage at a very competitive price. The lack of a modular interface means you may end up with a few redundant cables lying around, but these are shielded in metal brading and are less obtrusive than it might appear.